Access Media 3, Inc. (AM3), one of the Midwest’s largest non-franchised, provider of “triple-play” media services (satellite television, high-speed internet, and telephone) to multi-tenant residential, commercial, and multi-use properties, is pleased to announce it has selected JPMorgan Chase as the provider of its new senior credit facility to help fund its organic sales and acquisition strategy. Jordan Knauff & Company, an investment bank with offices in Chicago, Illinois, and Kansas City, Missouri, served as the exclusive financial advisor to Access Media 3. “I am very excited for us to partner with one of the most respected banks in the world,” said Scott Rediger, chief executive officer of AM3. “This relationship will provide Access Media 3 the necessary capital to fund its business plan. The credit facility will provide AM3 with the additional operating and financial flexibility we need to continue to deploy our services into new buildings and to undertake selective acquisitions,” added Rediger. Since its re-launch in January 2007, Access Media 3 has seen its Midwest operations grow from 3,000 subscribers to 10,000 in 17 months through a combination of organic growth and the integration of two acquisitions. With the new credit facility, Access Media 3 is expecting to continue its aggressive organic and acquisition growth strategy. 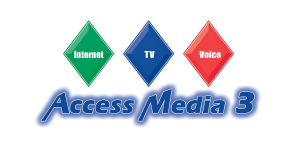 About Access Media 3, Inc.
Access Media 3, Inc, headquartered in Willowbrook, Illinois, provides triple-play media services (satellite television, high-speed internet, and telephone) to multi-dwelling resident and commercial customers in the Midwest. With a current base of approximately 10,000 subscribers, Access Media 3 is one of the Midwest’s largest non-franchised triple-play providers. For more information about Access Media 3, Inc., visit www.am3inc.com or contact Scott Rediger at 630-230-0555. Jordan Knauff & Company provides a comprehensive line of investment banking services to private companies of American business. Jordan Knauff & Company specializes in providing mergers and acquisitions advisory, capital formation, and strategic financial services to companies across the U.S. in a variety of industries. Typical transaction sizes range from $10 million to $300 million in total consideration. To learn more about Jordan Knauff & Company, please visit www.jordanknauff.com or contact G. Cook Jordan, Jr. at cj@jordanknauff.com or 312-254-5901.